Offering a never-fail performance outdoors, in emergencies, and when you just want to save on power, the Solar Tronics Solar Powered Radio offers up to 40 hours of use on a single solar powered charge. Never be without music, news, sports, or weather information--the Solar Tronics Radio either collects its charge from the sun or with a simple hand cranked generator without any polluting or fallible batteries to depend on. 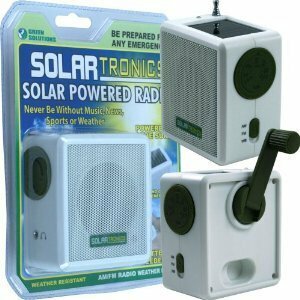 Offering AM/FM and WB (weather band) frequencies and weather resistant construction, the Solar Tronics is an ideal radio for boats, the car, on camping trips, or at home when the power goes out. Measuring just 2.25 x 3 x 3.625 inches, you will barely know the radio is there until you need it. A great radio charged by Solar Energy. Excellent for outdoors, camping or in emergency situations. Never be without music, news, sports or weather.20 minutes of listening after only 1 minute of cranking. 7 hours of listening when fully charged. When fully charged by solar energy you get 35 to 40 hours of listening. Features include: weather resistant construction, AM/FM and WB (weather band) frequencies, powered by the sun or easy hand cranked generator, up to 40 hours of listening on a full charge, no batteries required.